享曆 TGP-085-XXA系列 電源端子台: 額定電壓, 600V, 額定電流: 85A, 快速連接端子: 1/4" (0.250" or 6.35mm) Q.C. 4 Tab. 適用導線規格: 2.0-22 mm2 (#2-14 AWG). 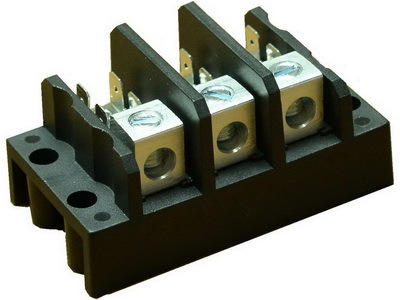 享曆 TGP-085-XXA1系列 電源端子台: 額定電壓, 600V, 額定電流: 85A, 快速連接端子: 1/4" (0.250" or 6.35mm) Q.C. 4 Tab. 適用導線規格: 2.0-22 mm2 (#2-14 AWG). 享曆 TGP-050-XXA系列 電源端子台: 額定電壓, 600V, 額定電流: 50A, 快速連接端子: 3/16" (0.187" or 4.8mm) Q.C. 4 Tab. 適用導線規格: 3.5-14 mm2 (#6-12 AWG). 享曆 TGP-050-XXA1系列 電源端子台: 額定電壓, 600V, 額定電流: 50A, 快速連接端子: 3/16" (0.187" or 4.8mm) Q.C. 4 Tab. 適用導線規格: 3.5-14 mm2 (#6-12 AWG). 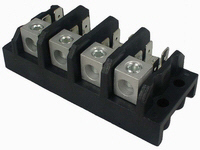 Shining E&E Industrial - terminal blocks, fuse holders, barrier strips, and solid state relays (SSR) professional manufacturer since 1978. 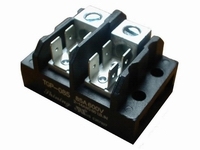 Terminal blocks at high quality and competitive price.